Is this what Kenyans are reduced to? 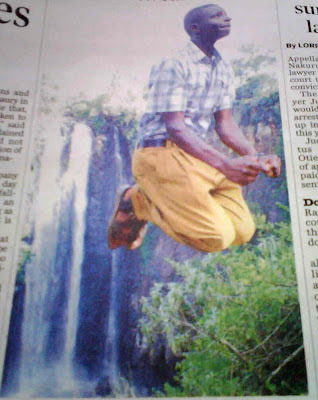 So there you go folks, just shows there’s bugger all news to report and Kenyans have nothing better to do than practice their levitating skills and hope someone takes a picture and puts it in the paper to waste some space! Just to prove how far we haven’t got with these discussions, this is a little excerpt taken from the leading story in The Daily Nation newspaper this morning; “Kibaki’s proposals on how to end poll crisis” as how they all stand as of yesterday. “According to a statement by the Presidential Press Service, the President was willing to work together and share responsibilities in Government with members of the ODM. The President, however, cautioned that any political solution that will be proposed must be in tandem with the current constitution. The Government side, which was expected to table its written proposal of a coalition government in which President Kibaki retained his positions as the Head of Government and Head of State with a readiness to appoint a non-executive Prime Minister, came up with a different suggestion. They submitted that President Kibaki was declared the winner of the 2007 Presidential elections and sworn in office according to the Constitution and should be recognised by ODM as the legitimate winner of the polls. Now we’re going to have a little challenge. Who can spot the difference between what is being said as of yesterday and what was being said 6 weeks ago when this row all kicked off and our country was put into this political stalemate? Anyone who can find a difference deserves a fat reward, (not of course from me, as I, as usual, am totally broke and the 57/= that I have in the bank currently will not get you much further than buying yourself a packet of chewing gum – well perhaps of course not quite a whole packet as that would be 60/= but almost a packet of chewing gum). But back to the point – what have these negotiating teams actually achieved, and does anyone know if Kofi Annan is perhaps looking for a house to buy so he can settle in Kenya for the next 5 years whilst he sorts this out, as he’s promised not to leave us in the lurch? I only hope he didn’t have his fingers crossed behind his back when he made that promise. « Summary of Ms Rice’s trip. I tell you solemnly the current Kibaki / Raila situation defines “deadlock”. It is my opinion that the Baks will not relinquish even an iota of power and Ogwambo will not rest until he gets restitution for a “stolen” election and the billions of Kshs squandered on what was the mother of all elections, which, YES beggars your question What the f***k are these guys discussing ? Sorry I do not have the answer. Incidentally if they do agree to share power, who will be the opposition as both parties will be in the government? Still giggling over the photo so can’t answer your serious question 😀 I’m sure you’ll forgive me? Peter – Now there’s a question. Yes – who is going to be the oppostition? I think it’ll probably mean absolutely nothing will get done for arguing over the decisions, but hey, what’s new? Nuttycow – Most definitely forgiven! I do wonder what he was up to tho – perhaps they had a ‘who can kick themselves in the bum the hardest’ competition? I have taken the bit between the teeth and will be arriving in Nbi early next Wednesday . What I am doing once there Heaven only knows, but my feet will be on Kenyan soil/concrete/tarmac/potholes and I will be happy, hearing the cries of “Mzungu, take my picture”. Do I really look like a tourist? Oooh OOOh Ooooh I want to be first in this game….. I can’t take the fist anwser out of the sack. I have to put them all together and judge each on its merits. I feel like a little kid going on holiday! Ridiculous! This is a working visit, not a sightseeing trip – well, maybe a bit of sightseeing. I no longer feel like a little kid. I have just read that TweedleO is threatening mass protests (= riots?) in one week if TweedleK doesn’t share the rattle. In one week. What else is happening in one week? Oh yes, I arrive in Kenya – sh!t. DM – I shouldn’t panic, we have lived with this stalemate for so long a little demo threat might be just the thing we need to hurry things along. Jason – Oh goody – a spammer has joined us and it soooo excited about his $900 bucks a month EXTRA. Gosh, Jason, you must be such a whizz. Check out his site at your peril. You can be sure I WILL NOT !! Do bugger off Jason, there’s a good chap!